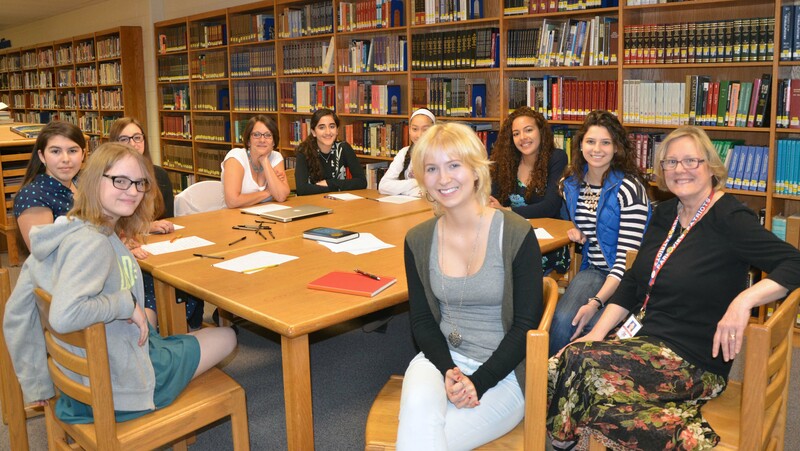 I’m just back from Loudoun County Public Library in Northern Virginia, where I spoke at It’s All Write, their annual short story writing contest for teens. It’s always amazing to me how many unexpected gifts are part of these visits. I got to see the work of young people coming up the ranks – always fun. This time around, too, I learned about how Loudoun has a book club for adults with developmental disabilities. (Guess what I’m interested in starting here in Richmond?) I met librarians who are secret playwrights and novelists. I met young people who want to study children’s book illustration. 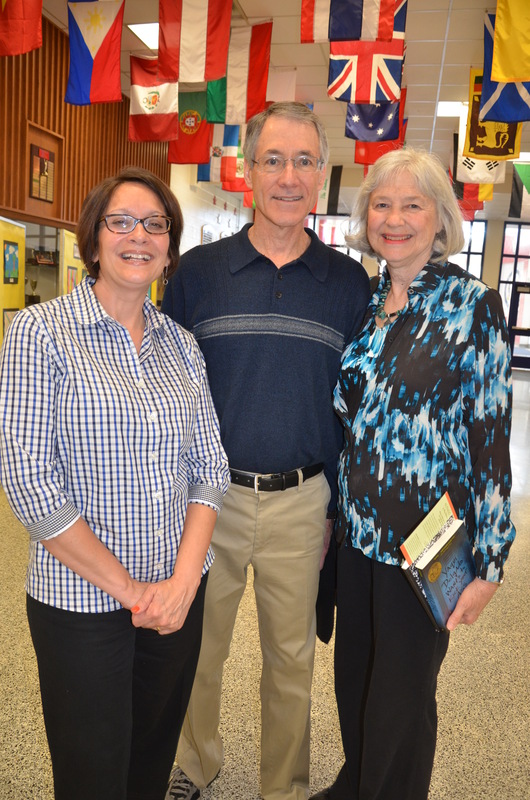 And, of course, I had the honor of meeting Bev and Wright Horton, a former teacher and a geologist, who are the long time benefactors of the program that touches hundreds and hundreds of kids in their area. They do so in honor of their late son, James, who loved writing. “James would have loved this contest,” Bev told me. Personal loss redirected into something positive for a community confirmed for me AGAIN that the literary arts – the stories of all of us – are a powerful force for connection and healing. 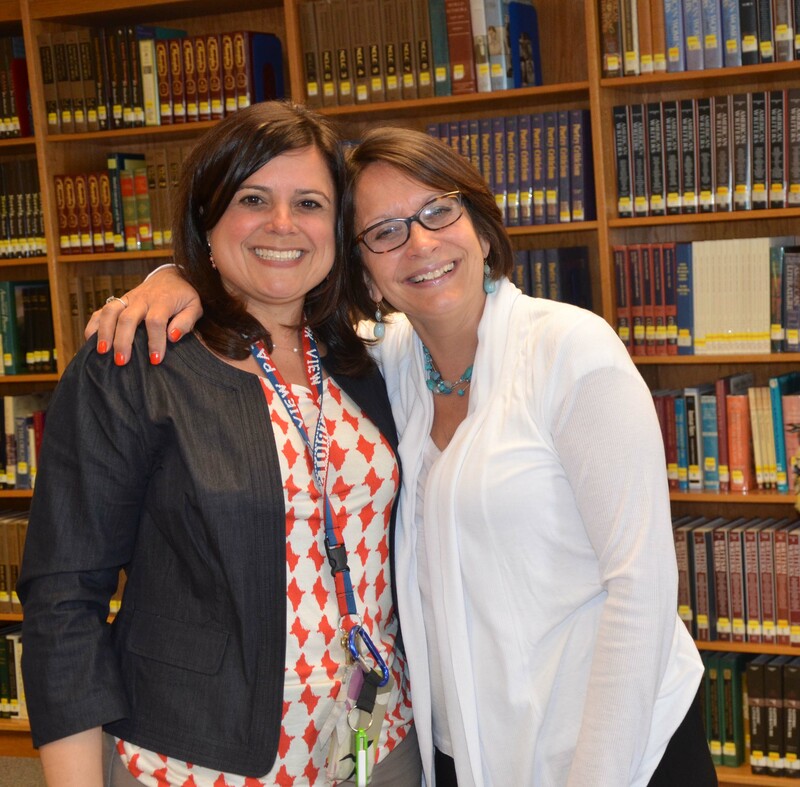 So for all of that, thank you (camera-shy)Linda Holtslander for the invitation to Loudoun County and for the chance to spend time with the amazing people at Park View HS, Tuscarora HS, and the Rust Library. Writing at Park View HS! My Cuban friend – Ms. Maria Clemens. I don’t have too much time to savor the downtime, but it’s for a good cause. This week marks DIA (April 30) – now known as Diversity in Action, so the next few days are all about inclusive literature for me. Check out my guest post as part of the DIA blog hop, organized by Latinas for Latino Lit. 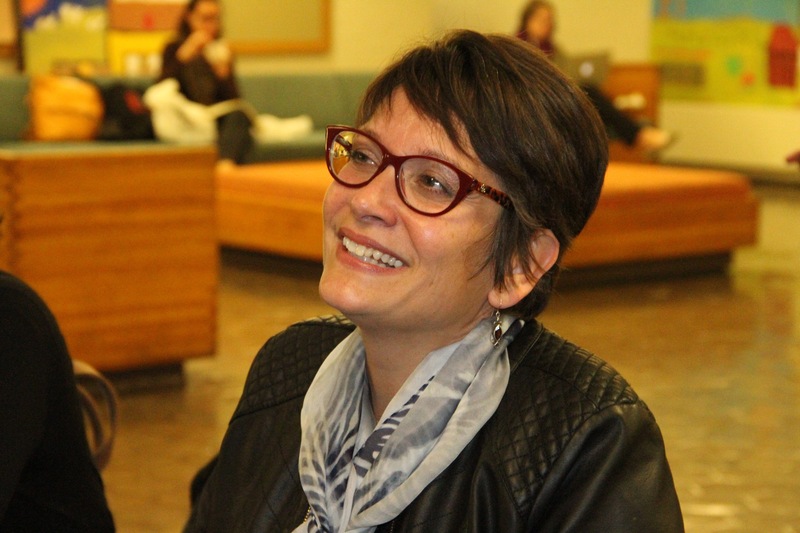 All week, Latino children’s book writers will explore the theme of immersion. I got matched with atypical familia, a blog about family, culture, and disabilities. I’m a guest there today talking about language, family connection, and how that looked in my own family. 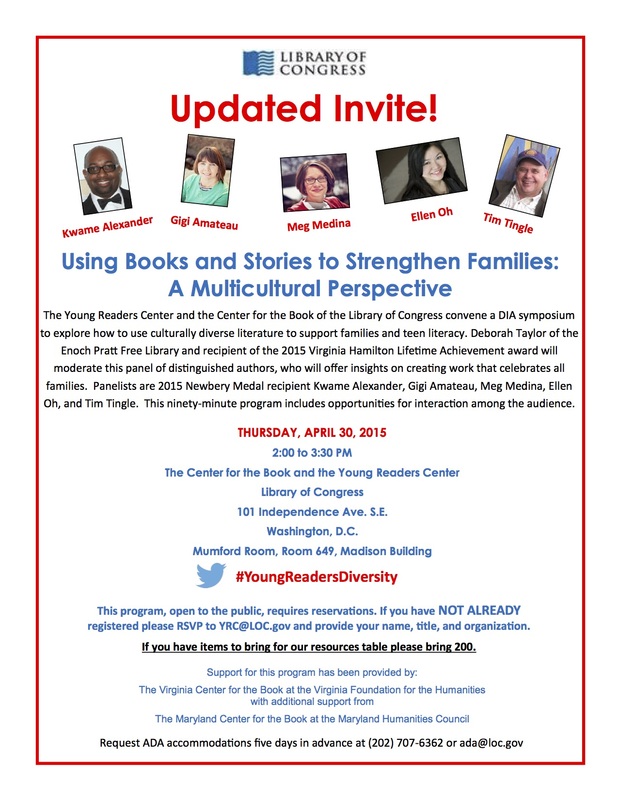 At the risk of driving you crazy, here’s a reminder: If you’re in the DC area, don’t forget that you can join me at a free symposium at the Library of Congress Young Reader’s Center. Kwame Alexander, Ellen Oh, Tim Tingle, Gigi Amateau and moderator Deb Taylor. (That’s a lot of good thinking in one room, if you ask me.) We’ll be looking at teen books and representations of family through various cultural lenses. I like that Karen Jaffe, the head of the YRC, targeted teens in this DIA event. Typically teens get the short straw for these celebrations. They’re asked to help with the crafts for younger kids, for example. This program addresses their literature and lives directly. I’m also grateful that the panel includes authors from many vantage points talking on a universal topic, rather than strictly about diversity. In coming years, I hope we’ll see events like this repeated with more and more underrepresented voices at the table talking about all sorts of topics within the world of books and young people. Diversity means everybody and six people can’t represent every voice. Finally, I’ll wrap up the week by driving up the road to Frederick, Maryland where The Curious Iguana has organized a teen and diverse lit event on May 1. Look for me with my pals from We Need Diverse Books. Ok – time to unpack, do laundry, and head out again.